Use the drop-down menu below to explore Skopelos. Larger, quieter and mesmerisingly pretty, this rocky island boasts an attractive capital, Skopelos Town; a beautiful Aegean port with winding cobbled streets, numerous (more than 120) churches, and steep hills rising from the harbour. The town teems with life, great for jewellery shopping along the waterfront and, of course, there’s a plethora of tavernas and bars. 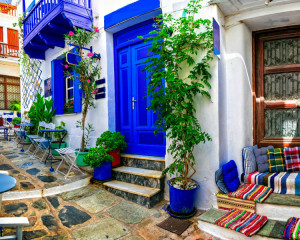 Skopelos history dates back more than 18 centuries with its aphrodisiac wine, noted by Aristotle, and its wonderful olive oil, but the island enjoys fame and fortune from a more recent past and movie goers and ABBA fans alike will know that, on the west coast, Kastani is Mamma Mia! beach, the Chapel of Ag Ioannis, the tiny church atop those winding steps and, down in the south, Amarantos Cape is the film’s extraordinarily scenic 3 trees location. All these popular sights are easy to visit by exclusive minibus tour or by cruising along the coast. Additionally, the island is blessed with numerous beaches including popular Stafylos, a pebble beach close to Skopelos and easily accessed by regular buses, shingle covered Agnondas located in a sheltered harbour and popular for those holidaying with small children and, another family favourite, Limnonari; a beautiful cove sheltering one of the island’s few sandy beaches. We sell a wide range of holidays to Skopelos so why not pop in to one of our branches or, call us on 01625 855855 as we'd be delighted to help you. Skopelos enjoys beautiful sunny days and a warm year round Mediterranean climate. The summer months enjoy particularly hot temperatures whilst the winter months are much milder. Getting to Skopelos is simple with many major airlines, including some "low cost" airlines, flying in to the neighbouring island of Skiathos from a number of regions across the UK and Ireland. From Skiathos a short ferry ride takes you to the island of Skopelos. Car Hire is the most popular way of exploring this beautiful island and is widely available.